After having travelled close to 550km in three days last weekend, the Ottawa 67’s now turn their focus to an extended home stand. The 67’s face the Mississauga Steelheads in a mid-week battle on Wednesday, the first of five-straight games at TD Place. In all, Ottawa plays nine of its next 10 games at home, with a trip to Oshawa the only road game in that span. 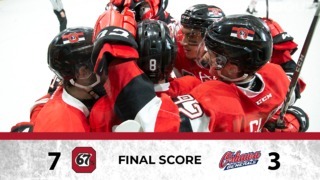 The 67’s will be keen to make these games count and rise up in the standings. They are coming off a closely fought, 5-4 overtime loss to the Guelph Storm. The 67’s are currently eighth in the Eastern Conference but just three points separate them from the North Bay Battalion in sixth place. A strong performance in these home games will see them gain valuable points and positions in the standings. 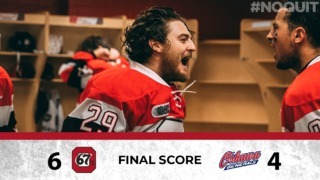 2018 has seen the 67’s win two games and lose three. The wins included a morale-boosting 5-0 victory over the Gatineau Olympiques. Among the losses, two of them were in the overtime. The Ottawa side has scored 17 goals and conceded as many in the last five games. 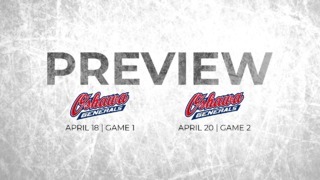 The 67’s will be keen to convert those narrow losses into victories. The Steelheads saw their four-game win streak halted when they lost to Soo Greyhounds in the last encounter. In that game, they were leading 3-2 at the end of the second period only to concede 5 goals in the final period and end up losing the game 7-4. They have a strong offence that has seen them score 25 goals in the last five games. However, they have also conceded 18 goals in those games. The 67’s will have to watch out for defenseman Nicolas Hague who has scored 16 points in his last 10 games for the Steelheads. The Mississauga team also play well with a man advantage, producing a power play percentage of 24.6% that puts them fourth in the OHL. The last meeting between these two teams resulted in a 4-3 win for the 67’s and Ottawa will be keen to repeat that performance. Get to your seats early, as 67’s alumnus Darren Pang will be honoured during game ceremony. Sasha Chmelevski has scored three points in the last two games. Tye Felhaber had a strong game against the Storm, scoring three points in that game. The 67’s have a better penalty kill percentage (79.8%) as compared to the Steelheads (77.6%). Tickets for Wednesday night’s game are available by clicking here, calling 613.232.6767 x1, or in person at the box office at TD Place.